» What is Speech Therapy? Evaluation: The basis of therapy. The evaluation your child receives is the first step of therapy. Evaluation includes careful observation and measurements of your child’s speech & language abilities. From those observations and measurements, the clinician develops a treatment plan to meet your child’s individual needs. Measurement does not end here. Throughout therapy, the clinician will measure your child’s progress to set new goals for learning. Precise evaluation is an important part of therapy. 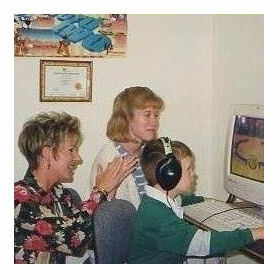 Speech & language therapy involves a series of activities to meet specific goals. These goals are usually accomplished over time. Only rarely can a child’s communication skills be changed in 1 or 2 sessions. The length of therapy cannot really be predicted, but usually the more serious the delay or disorder, the longer the period of therapy. This is not to suggest that your child will fail to improve right away. You may see immediate improvement. Then a period of gradual progress may begin. Your child may show steady improvement from the beginning or sudden spurts of growth may occur over the course of therapy. The rate and pattern of improvement is different for every child. There are many successful ways to treat children’s communication disorders, all have several factors in common. Your child will learn new skills in therapy. Depending on the nature of your child’s disorder, he or she may be asked to learn new behaviors (such as pronouncing a certain speech sound), to modify behavior that interfered with adequate communication (such as reducing speech rate or loudness of voice), to relearn skills that may have been lost due to an acquired disability, to improve speech through muscle stimulation and by combining motor-speech practice with medical procedures such as surgery or dental appliances, or to augment oral communication with a variety of alternative, non-vocal communication devices (gestures, sign language or electronic instruments that produce synthesized speech). Speech & Language Therapy proceeds in small steps. Therapy is based on a carefully designed sequence of practice. The clinician selects key communication skills that are taught in several ways-drill & practice, play interactions or conversations. The difficulty of the response required from your child is gradually increased over time. Thus, your child may be asked to practice using single words before using phrases and/or sentences. The clinician will be careful to reinforce or reward desired responses. Your child will be clearly told which responses are correct and which are not correct. The therapy is programmed in small steps so that your child receives much success and reward, especially early in the therapy process. Gradually, your child is challenged to improve or expand speech & language skills. Parents play a key role in the therapy process. As parents, you will likely be asked to help by observing your child outside of therapy and helping your child practice at home. The Clinician will help you learn how to respond to your child’s communication difficulties. You may also be asked to model certain speech & language forms as an example for your child. An important role for the parent is to assure your child’s steady attendance at therapy sessions and to maintain a positive attitude about the therapy process. How often your child attends therapy depends upon the child’s age, the nature and severity of the communication disorder, and practical considerations of the cost and availability of services. Most commonly, children and seen twice weekly. The length of the session also varies, though typically our therapy sessions last 30 minutes.